An exiled lord from the North, Ser Jorah earned his knighthood during Greyjoy’s Rebellion, being one of the first to enter the breach in the walls of Pyke during the last battle. Having won as a bride the daughter of a ancient and powerful Hightowers, he soon fell into great debt trying to keep her happy on his rustic, isolated island. Breaking the laws of Westeros by selling poachers into slavery, he fled Lord Stark’s justice, selling his sword in the east until his wife abandoned him. Balding, burly, and beared, Ser Jorah’s as tough as they come. His father Jeor is Lord Commander of the Night’s Watch. 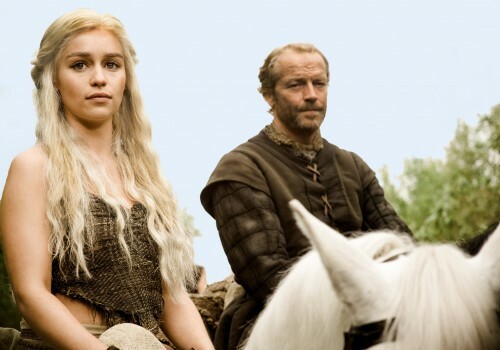 As Martin has noted, Iain Glen is rather handsomer than how Ser Jorah is described. He does not seem to be balding, for that matter, which probably does not help.